Japanese carmakers Honda and Nissan have added 2.8 million vehicles to the recall they issued last year over a defect in passenger airbags. The affected vehicles have a defective part which "could cause the airbag inflator to rupture and deploy the airbag abnormally in a crash". Earlier this month, Toyota added 650,000 cars - all in Japan - to its initial recall. 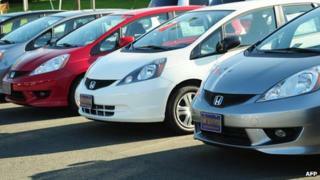 Honda said its latest recall affects at least 13 models, including the Fit (or Jazz in the UK), Stream, CRV and Civic. Meanwhile, Nissan's recall affects 16 models globally, including the Cube, Terrano and Sylphy. Earlier this month, Toyota, the world's biggest carmaker, said it had received one report of a seat cover burn due to the problem.